Museum Batik Yogyakarta is one of the few museums in Indonesia that has hundreds collections of batik from many centuries ago. Once we have paid the ticket, a tour guide is assigned to us. She is very narrative and help us understand the many tools used to produce batik, the process to produce batik, as well as the batik patterns. 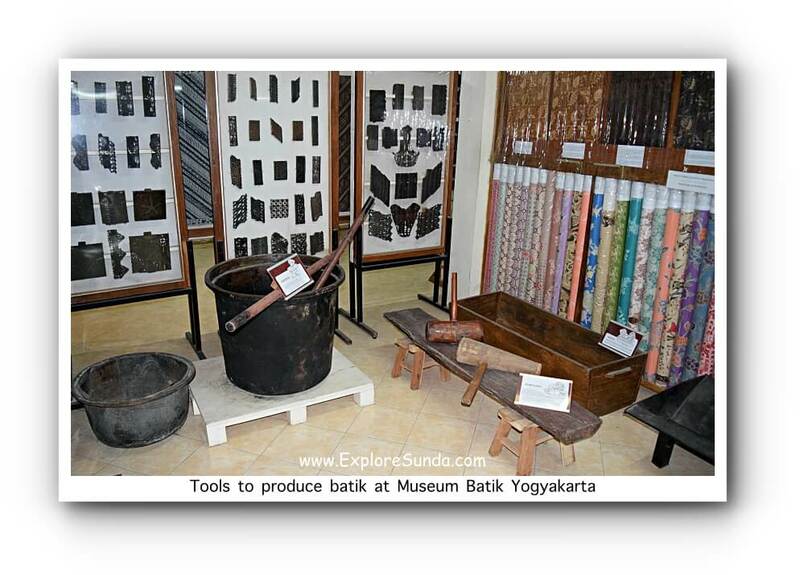 We started the tour in the first section of the museum, which displays all of the tools to produce batik. Batik tulis, where the artisans write or paint the cloth with liquid wax. Batik cap or stamped batik. Originally all batik were batik tulis. Over the years, people tried to find easier and faster way to produce batik. Thus, batik cap was introduced. The wax is stamped using several copper template, instead of painting the wax line by line. The introduction of batik cap was the beginning of the mass production of batik. It is cheaper than batik tulis, hence, more people can afford to buy it. Nowadays, textile factories can produce more mass production of batik. The result is called printed batik. It is similar to other printed fabrics, but it is printed with batik patterns. Back to the museum, the next steps are coloring batik. Both types of batik receive same treatment. They are either dyed in one color or painted with many colors. Once they are dry, we give them fixation gel to lock the colors. We dry them again and finally we boil the fabric to release the wax. So, it is a long process to produce a piece of batik. 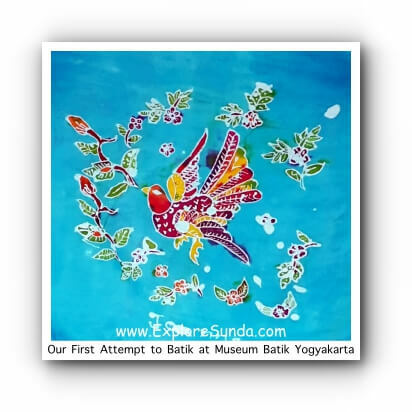 The next section of Museum Batik Yogyakarta displays various types of batik from many different places of Java. Each region has its own specialty particularly on the colors and patterns. Batik Yogyakarta is famous with its dark blue. It also has special patterns for Sultan and his royal family. The special color of Batik Solo is red brown. Batik Lasem is easily identified by looking at its distinct red. No other region can produce that kind of red. Batik pesisir made in coastal towns of northern Java is colorful. Batik pagi sore was introduced during difficult time in 1940s. Two patterns in one fabric makes it seem the owner has 2 pieces of batik instead of 1. The Dutch influence reflected in the pattern of boat and anchor. The Chinese influence showed up in the painting of dragon, phoenix, and peony. The Indonesian Chinese also use batik as the table clothes decorating their family altar. Due to the limited space and the many collections, the museum rotates the display based on theme. Since the batik collection is the heart of Museum Batik Yogyakarta, we are not allowed to take pictures here. Should we desire any of the collection, we can order a duplicate to be made by the museum. However, although the pattern can be duplicated, the color can't be exactly the same due to different dye used. The last section is the private collection of embroidery paintings made by the wife of the museum founder. She made a lot of embroideries on landscapes as well as close up faces of her families and famous people. One of her embroidery received a MURI (Museum Rekor Indonesia = The Indonesia World Records Museum) recognition as the largest embroidery painting ever made. The museum tour ends at the workshop where 2 staffs are painting wax on white fabric, the first step of batik. We also can learn how to do it. The lesson is Rp. 40,000/hour. One thing for sure: it is not an easy job! Although we only required to trace the pattern using canting, we need a lot of patience and a bit of artistry also help. A canting looks like an open fountain pen, we refill the hot wax on its open container then we outline the pattern with this hot wax. We must make sure the tracing is even all over the picture. First timer like us usually has problems with leaking wax all over the canting making so many unintended spots on the fabric. Once the wax dried, we turn over the fabric and outline the pattern on the other side of the fabric. No wonder one sheet of batik tulis take weeks even months to produce! 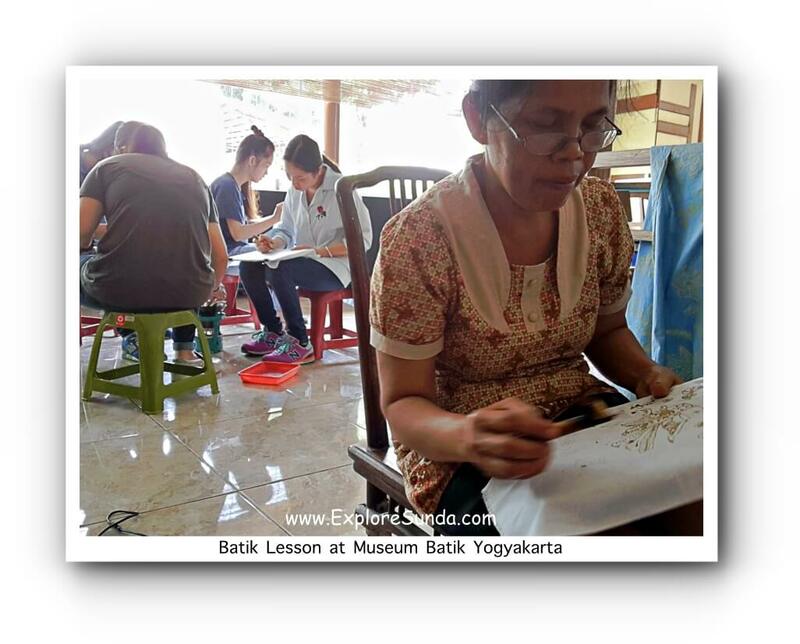 Museum Batik Yogyakarta has a starter kit to do batik at home, complete with its canting, wax, wax burner, paint, and a piece of fabric. It is a good kit to practice creating batik at home, however, due to the many steps involved, often it is frustrating. So, I think it is better we try it first in the museum. The staffs are very helpful, so at the end of the lesson we will be proud of our creation and encourage to start new ones at home. 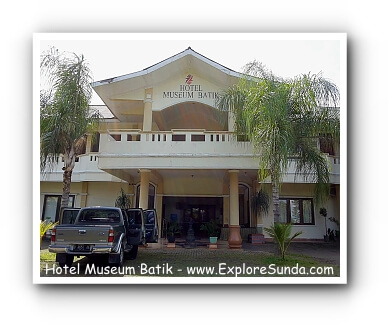 Should you wish to spend some time learning batik or explore Yogyakarta, the museum has a hotel: Museum Batik Hotel, it is right beside the museum. The address of the museum is jalan Dr. Sutomo 13A, Yogyakarta. Actually, you will only see the museum signage in that street. Just follow the signage to a small road, since the entrance gate to the museum is in that small road. Don't worry about parking area, since they have big parking lot inside.